Rejji Kuruvilla is a professor of biology whose research focuses on the development and functions of the sympathetic nervous system. She received her BS from Calcutta University in India, her PhD from the University of Houston, and did her postdoctoral work at Johns Hopkins University School of Medicine. Research in the Kuruvilla laboratory is focused on understanding the development and functions of the sympathetic nervous system. The sympathetic nervous system, a branch of the autonomic nervous system, is critical for organ homeostasis. Sympathetic axons innervate diverse peripheral organs and tissues to govern fundamental physiological processes including cardiac output, body temperature, regulation of blood glucose levels, and immune functions. A dysfunctional sympathetic nervous system has been associated with several prevalent disorders including congestive heart failure, hypertension, diabetes, immune dysfunction and epithelial cancers. Notably, an emergent concept is that early deficits in the sympathetic nervous system, likely acquired during development, contribute to the etiology of some of these diseases. Our laboratory investigates the development and functions of sympathetic neurons using mouse genetics, cell biological approaches, imaging, and physiological analyses. There are two major research directions in our laboratory that focus on reciprocal interactions between sympathetic neurons and their target organs/tissues: (1) To define how sympathetic neuron connectivity is established and refined by the actions of neurotrophic signals secreted from target tissues, and (2) To elucidate how sympathetic nerves instruct target tissue development and function, focusing in particular, on the islets of Langerhans in the pancreas. 1. Control of sympathetic neuron development by target-derived trophic signals: The formation and refinement of sympathetic neuron circuits during development relies on interactions between neurons and their post-synaptic target tissues, often located millimeters or even meters away from the neuronal cell bodies. Sympathetic neurons rely on the soluble neurotrophin, Nerve Growth Factor (NGF), secreted from target tissues to survive, innervate targets, for dendrite growth, and for the formation and maintenance of synaptic connections. A fundamental question is how the NGF signal impinging on axon terminals is transmitted back to remote cell bodies where the nuclei reside to regulate changes in gene expression necessary for neural development. We and others found that NGF binds to its TrkA receptor tyrosine kinase expressed on sympathetic axons, prompting the internalization of ligand-receptor complexes into endocytic vesicles. These vesicles signal locally in axons to acutely regulate local growth events and are also transported back to cell bodies where they signal to control transcriptional events necessary for neuron survival, growth, and differentiation. Work over the last 12 years in our laboratory has focused on defining the membrane trafficking pathways by which target-derived NGF controls neuron development. We have approached this question at different levels, from the biochemical characterization of neurotrophin signaling in axons and cell bodies, to defining the cell biology of Trk receptor endocytosis and transport, to the use of mouse genetics for functional studies in vivo. In particular, we have been successful in utilizing a compartmentalized culture system where neuronal cell bodies and axons are in fluidically isolated compartments allowing us to study their distinct responses to extrinsic signals and to also manipulate these neuronal compartments separately. This system has allowed us to identify new molecular mechanisms by which secreted neurotrophic factors signal locally in axon terminals and retrogradely in neuronal cell bodies to promote neuron survival and target innervation. The use of mouse genetics allows us to determine the relevance of our findings in vivo. a. Identifying mechanisms of neurotrophin receptor endocytosis: A long-standing question is whether and how signaling receptors influence their own endocytic trafficking. We identified a TrkA-initiated signaling pathway that is responsible for promoting receptor endocytosis in sympathetic axons (Bodmer et al., Neuron 2011). We found that NGF binding to TrkA receptors, recruits the downstream effector enzyme PLC1, which then activates a calcium-responsive phosphatase, calcineurin. Calcineurin dephosphorylates specific splicing isoforms of the endocytic GTPase, dynamin1, to drive TrkA endocytosis. We showed that this signaling axis is essential for NGF-dependent trophic functions during development since genetic deletion of calcineurin or interfering with its ability to dephosphorylate dynamin1 disrupts NGF-dependent axon growth and neuron survival. b. Aberrant neurotrophin trafficking contributes to developmental defects in Down syndrome mice: The finding that calcineurin promotes TrkA endocytosis led us to identify a link between impaired neurotrophin trafficking and developmental defects in Down syndrome, which is associated with trisomy of human chromosome 21. One of the genes that is triplicated in Down syndrome is Regulator of Calcineurin1 (RCAN1), an endogenous inhibitor of calcineurin phosphatase activity. We found that RCAN1 over-expression impairs TrkA internalization and attenuates retrograde NGF signaling in sympathetic neurons (Patel et al., Nat. Comm 2015). In a mouse model of Down syndrome, we observed deficits in TrkA trafficking, loss of sympathetic neurons, and diminished axon innervation, all of which could be ameliorated by genetically correcting RCAN1 levels (Patel et al., Nat. Comm 2015). Our study suggests that an imbalance in RCAN1 gene dosage is a key mechanism contributing to sympathetic phenotypes in Down syndrome mice, likely by interfering with TrkA receptor endocytosis and retrograde trophic signaling. 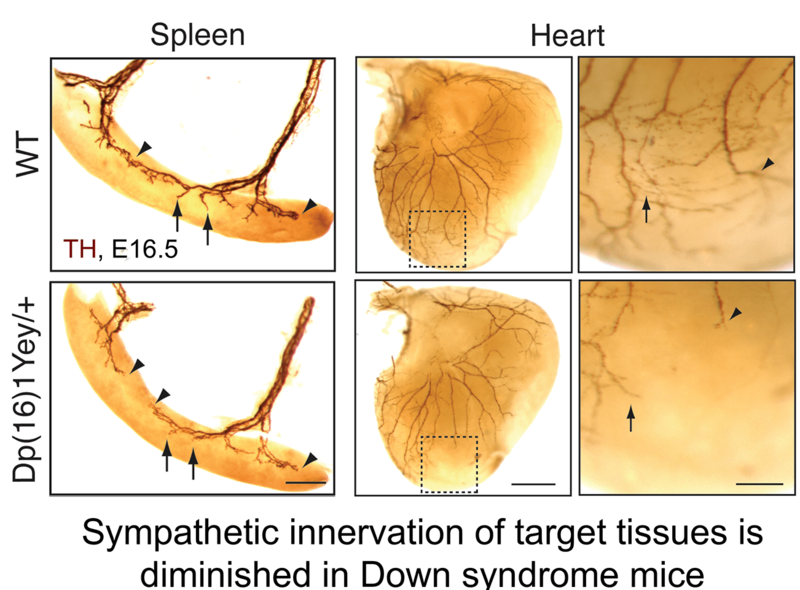 These findings in mice posit that autonomic dysfunction in individuals with Down syndrome could stem in part from defects in neurotrophin signaling and aberrant development of sympathetic neurons. c. Uncovering a ligand-triggered mode of axonal targeting of neurotrophin receptors: An essential feature of neurotrophin signaling is having Trk receptors in the right place at the right time. Internalization of TrkA receptors in axon terminals and transport to remote cell bodies for trophic communication (retrograde transport) must be balanced by delivery of newly synthesized receptors to axons (anterograde transport) to ensure continued responses to target-derived ligand. However, compared to the intense focus on retrograde trafficking of TrkA receptors, relatively little is known about their anterograde delivery. We discovered that TrkA receptors are delivered to sympathetic axons by transcytosis, where the TrkA protein is first delivered to the plasma membrane of cell bodies, but then internalized and directed to axons (Ascano et al., J. Neurosci. 2009). Remarkably, this anterograde TrkA transcytosis is triggered by NGF itself acting on axons, providing the first evidence for a mode of ligand-triggered long-distance trafficking of receptors from cell bodies. 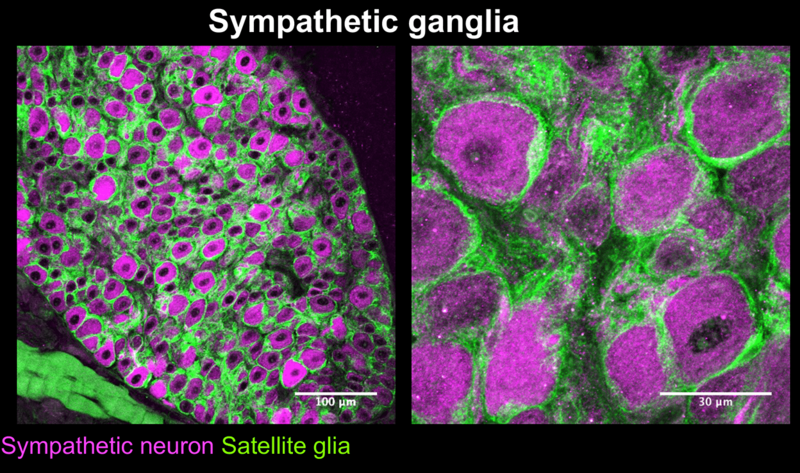 During development, sympathetic neurons compete for limiting amounts of target-derived NGF for survival and axon innervation of target tissues. Our findings suggest that NGF-promoted TrkA transcytosis serves as a positive feedback mechanism to dynamically scale up axonal TrkA levels at times of need. 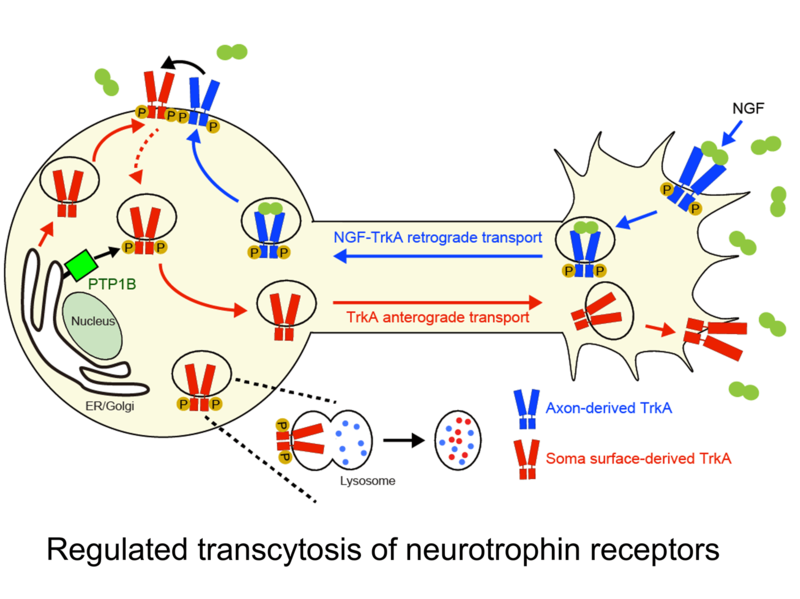 In more recent studies, we found that anterograde TrkA transcytosis is controlled by the activity of retrogradely transported TrkA receptors in cell bodies (Yamashita et al., Dev. Cell. 2017). Furthermore, we identified that TrkA transcytosis is primed by the activity of PTP1B, an ER-resident protein tyrosine phosphatase, in cell bodies. Together, our findings address a fundamental, yet poorly studied, cell biological, question of how signaling receptors are directed to axons and provide insight into specialized mechanisms that enhance neuronal responsiveness to spatially acting extrinsic cues. 2. 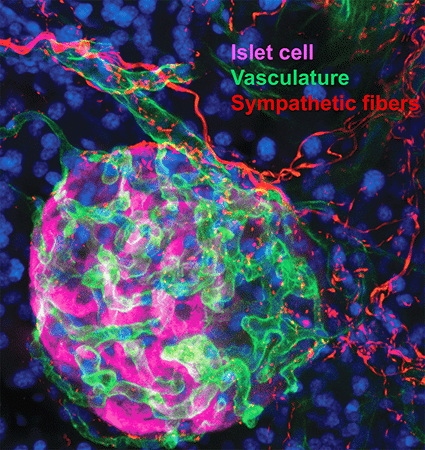 Sympathetic innervation is essential for pancreatic islet development and function: During development, sympathetic neurons extend axons in tandem with the morphogenesis of target organs/tissues. Whether innervation contributes reciprocally to organogenesis has not been clearly defined. In the last 6 years, we have turned to a new question of whether sympathetic neurons contribute to the morphogenesis of a target tissue. Pancreatic islets, the functional units in regulating blood glucose levels, are richly innervated by sympathetic nerves. Employing genetic mouse models and neuron-islet co-cultures, we discovered that sympathetic innervation is essential for organizing islet structure during development (Borden et al., Cell Rep 2013). Further, we demonstrated that this inductive interaction at early stages is critical for mature islet function in regulating glucose metabolism, suggesting that developmental perturbations in sympathetic innervation might underlie metabolic dysfunction in humans. During the course of our pancreas studies, we also identified that NGF, classically considered as a survival and growth factor for neurons, promotes glucose-stimulated insulin secretion from pancreatic beta cells (Houtz et al., Dev. Cell 2016). We defined a paracrine mechanism whereby NGF derived from pancreatic vascular cells acts on neighboring TrkA-expressing beta-cells to augment glucose-induced insulin secretion. Mechanistically, TrkA-mediated endosomal signaling and actin remodeling, previously characterized in trophic signaling in neurons, are also employed for insulin secretion in beta cells. These unexpected results reveal conserved mechanisms employed by neurotrophic factors for different functional outcomes in neurons and pancreatic endocrine cells. Larry S. Zweifel, Rejji Kuruvilla, and David D. Ginty, 2005. Functions and Mechanisms of Retrograde Neurotrophin Signaling. Nature Reviews Neuroscience 6, 615-625. Gregorio Valdez, Wendy Akmentin, Polyxeni Philippidou, Rejji Kuruvilla, David D. Ginty and Simon Halegoua, 2005. Pincher-mediated macroendocytosis underlies retrograde signaling by neurotrophin receptors. J. Neuroscience 25 (21), 5236-5247. Xi Chen, Haihong Ye, Rejji Kuruvilla, Narendrakumar Ramanan, Katherine W. Scangos, Chao Zhan, Nicolas M. Johnson1, Pamela M. England, Kevan M. Shokat and David D. Ginty. 2005. A chemical–genetic approach to studying neurotrophin signaling. Neuron 46, 13-21. Rejji Kuruvilla * , Larry Zweifel * , Natalia Glebova, Bonnie Lonze, Haihong Ye and David Ginty. 2004. A neurotrophin signaling cascade coordinates sympathetic neuron development through differential control of TrkA trafficking and retrograde signaling. Cell 118, 1-20. Haihong Ye * , Rejji Kuruvilla * , Larry Zweifel and David Ginty. 2003. Evidence in support of signaling endosome-based retrograde survival of sympathetic neurons. Neuron 39, 57-68. Rejji Kuruvilla, Haihong Ye and David Ginty. 2000. Spatially and functionally distinct roles of the PI3-K effector pathway during NGF signaling in sympathetic neurons. Neuron 27:499-512.